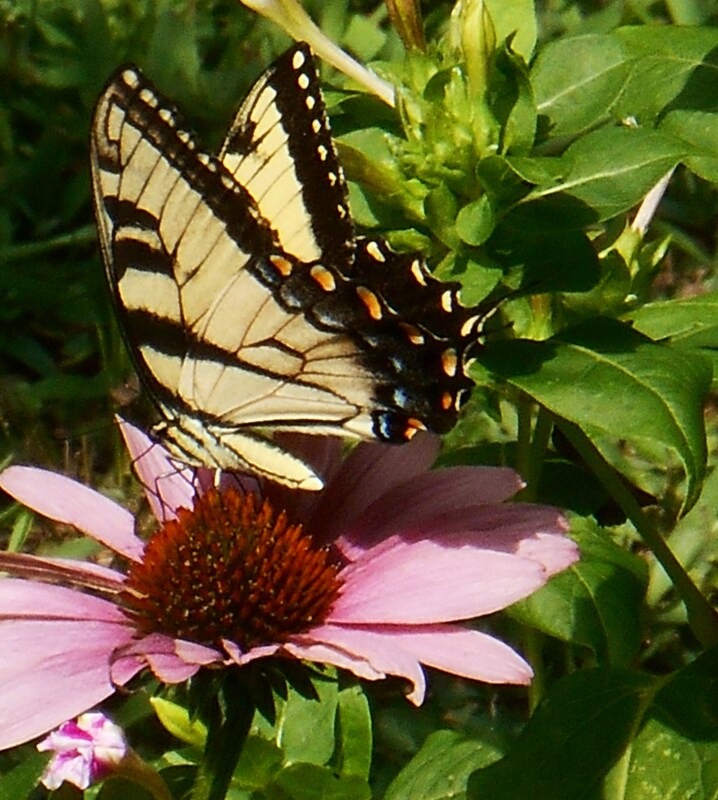 July 2014, an Eastern Tiger Swallowtail enjoys the Echinacea. Even before buying this home, we were enchanted by the many butterflies and songbirds darting around from tree to tree behind the house. There were trees I couldn’t even name covered in sweet smelling flowers growing in the edge of the ravine, Rose of Sharon bushes behind the house, and a great Mimosa tree covered in silky pink flowers. 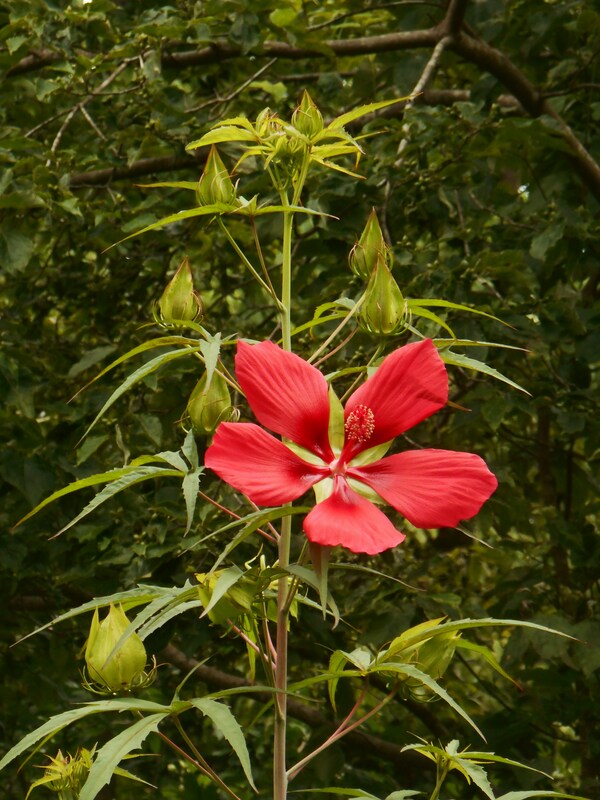 Butterflies flew a circuit from one to the next, and bright hummingbirds flew unbelievably close to our windows to get to the huge Rose of Sharon flowers. Over that first long winter, I planned for a butterfly and hummingbird garden to bring these bright creatures even closer. We have been rewarded many times over by the beauty of both the flowers and the birds and insects drawn to them. 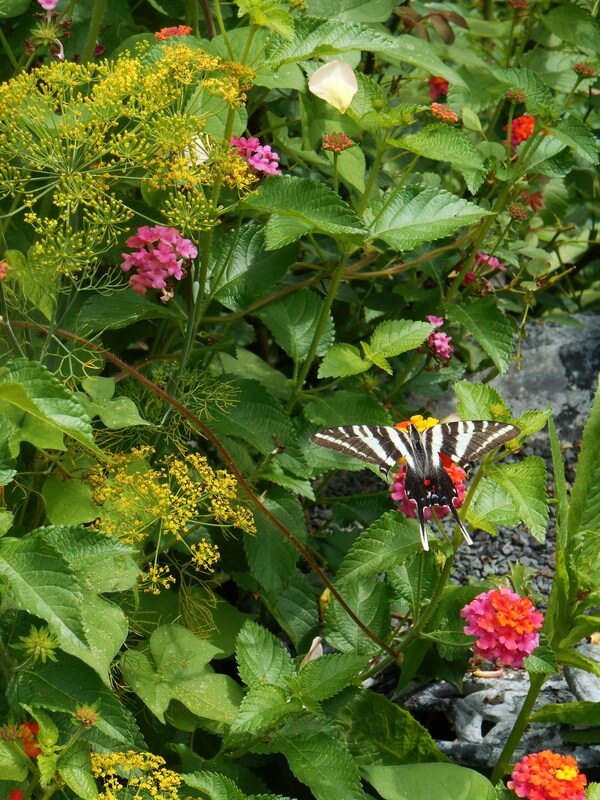 Sages, zinnias, Lantana and roses provide a constant variety of sweet nectar in the butterfly garden. By nature, these animals like to stay on the move, and appreciate a variety of different locations where they can feed. We provide several beds of nectar rich flowers, and also grow pots and baskets of flowers on the deck and patio to attract them close to our windows. This keeps them well fed and attracts a huge variety of bees, dragonflies, and other insects in addition to the butterflies. 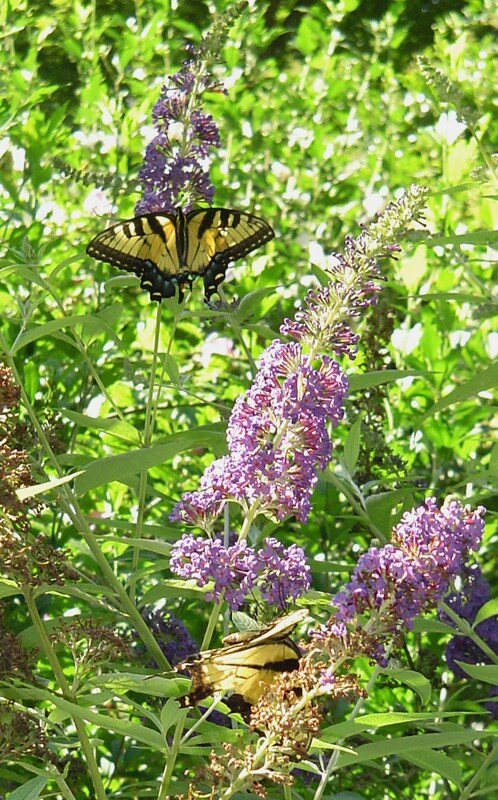 Buddliea, or Butterfly Bush, attracts lots of attention in the garden and is a generous supplier of nectar. New compact hybrids are available, but the species can grow quite large and benefits from hard pruning in February. In addition to food, butterflies and hummingbirds need safe areas to rest and sun themselves and a source of water. A shallow dish full of sand, gravel, and fresh water serves the butterflies. Hummingbirds enjoy flying through a gentle spray of water, whether from a fountain or a garden hose. Butterfly tree attracts many butterflies and hummingbird moths to the garden. These grow wild in our neighborhood. It is important to use organic products, and avoid poisons, in areas bees, butterflies, and birds frequent. 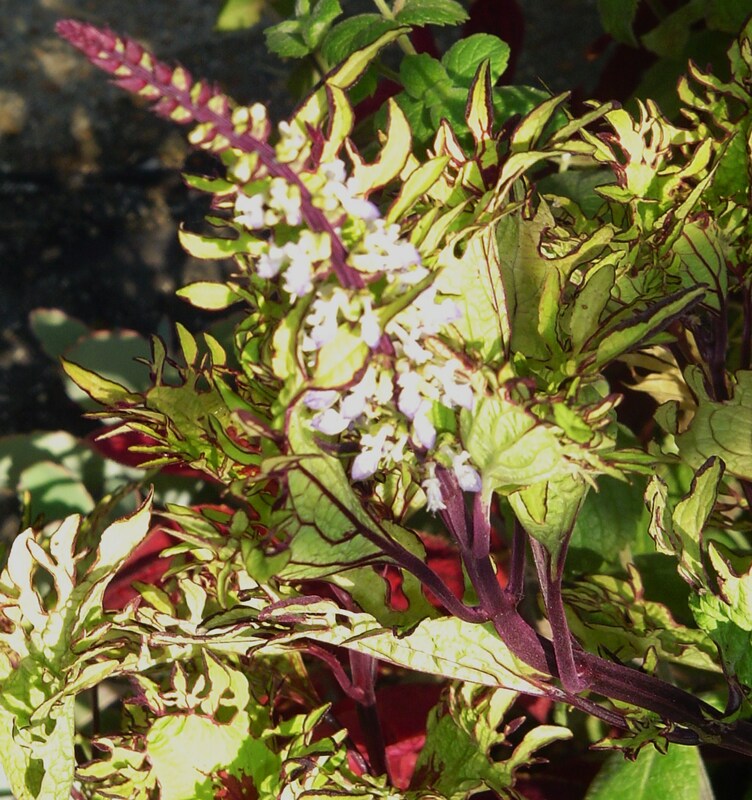 There are high quality and affordable products widely available to fertilize and control fungal infections for the plants. Attracting a wide variety of insects and birds keeps any insect infestations in check. A huge variety of song birds will show up to feast on the many insects attracted to this garden. Hummingbirds also eat insects. I frequently find toads, turtles and small lizards in our butterfly gardens feasting on whatever insects crawl or fly past. Bats visit our garden at dusk, leaving their shelters in the ravine to fly loops over our garden, devouring insects as they fly. Using poisons of any kind will defeat the purpose of a garden planted to attract wildlife. 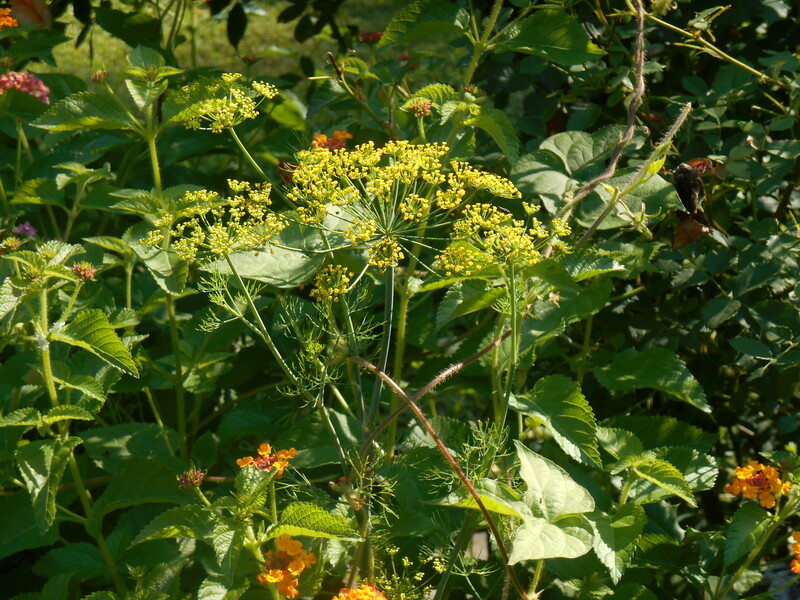 Dill with Lantana offer an irresistible attraction for butterflies and other small pollinating insects. Our butterfly gardens have evolved and grown over our six summers now in this garden. 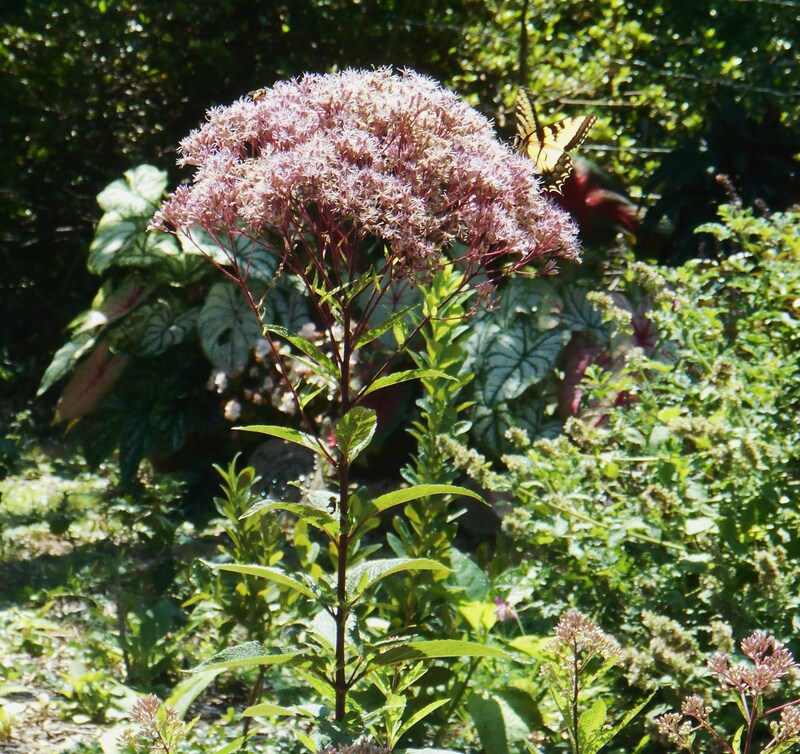 We have added a greater variety of native perennials like Joe Pye Weed, Milkweed, and hardy native Hibiscus. 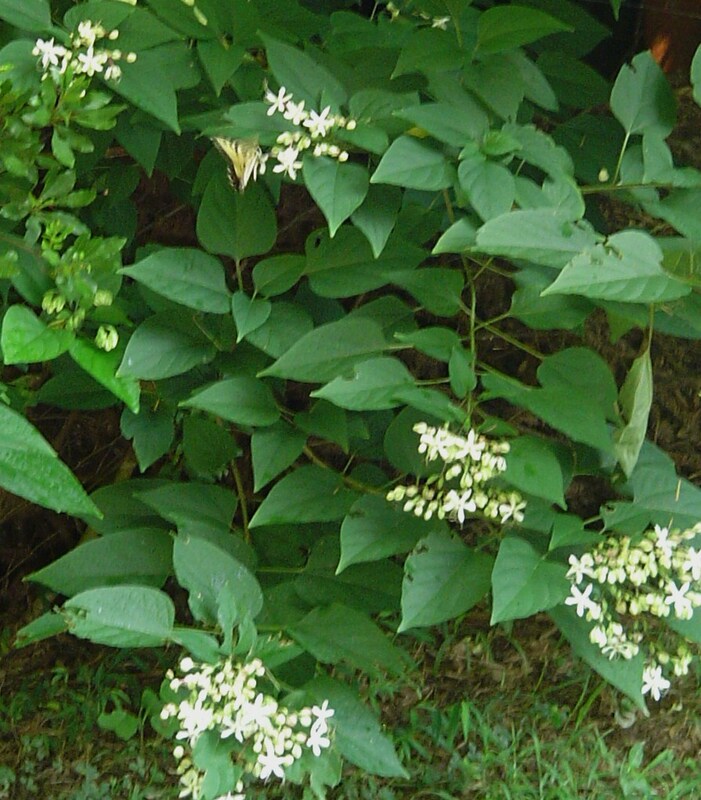 We have also planted more herbs and other fragrant plants distasteful to the deer. We always include herbs which double as host plants, such as fennel, dill and parsley. 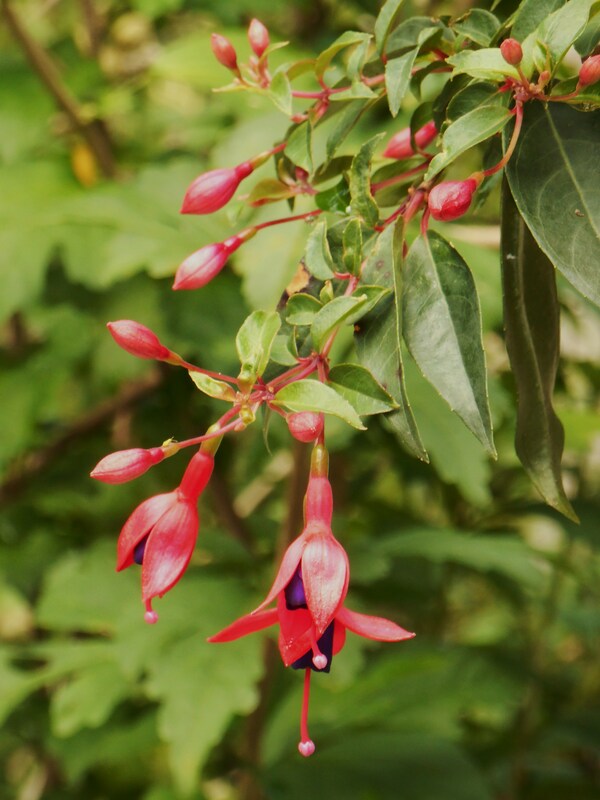 Baskets of Fuchsia keep hummingbirds happy and frequent visitors. We have opened up new gardens in every part of the yard, leaving some natural areas for habitat. 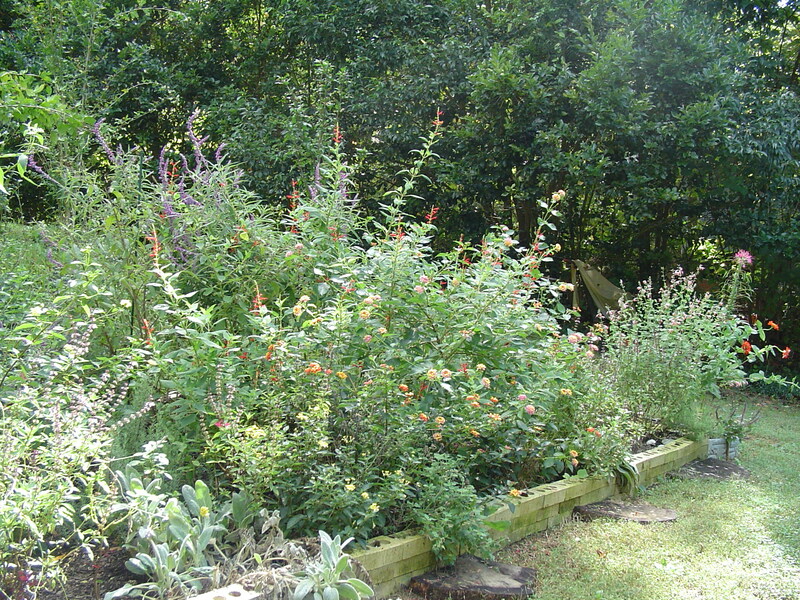 From Crepe Myrtle and Lantana growing at the top of our garden along the street to gardens terraced down the back slope towards the ravine, there are abundant food sources to attract a variety of nectar loving creatures. 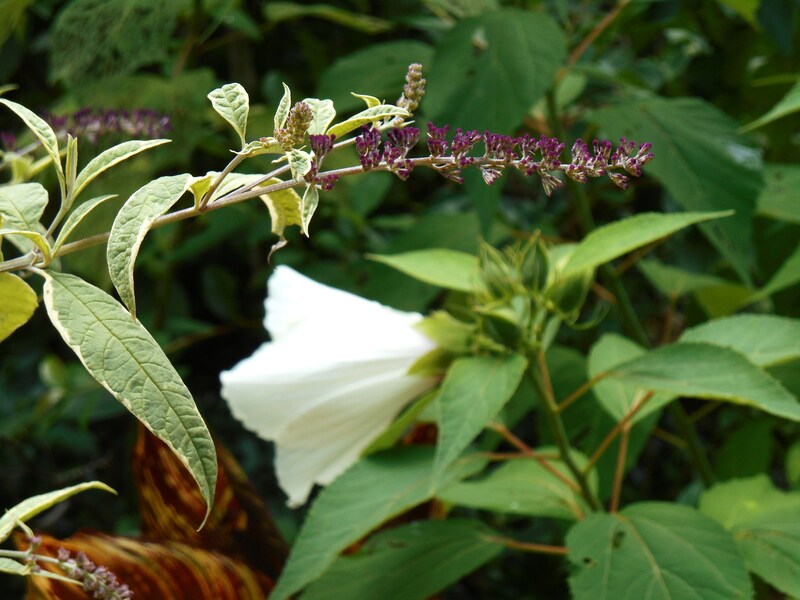 The garden always grows more exciting after the first hummingbird and first butterfly is sighted in the springtime. It feels very empty when they depart in the autumn. But for those wonderful months in between, we enjoy exploring the garden each day, watching for these fascinating visitors. 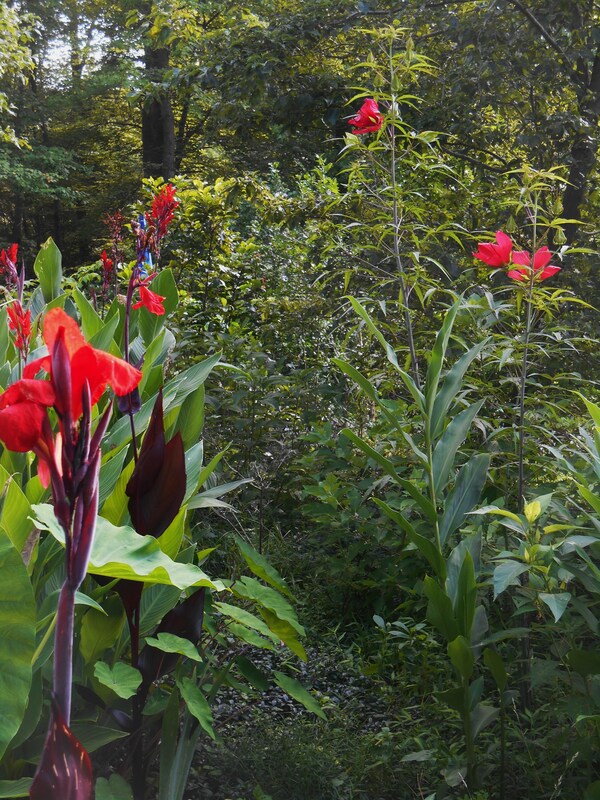 Red Canna flowers and Hibiscus attract both hummingbirds and pollinating insects, including butterflies. 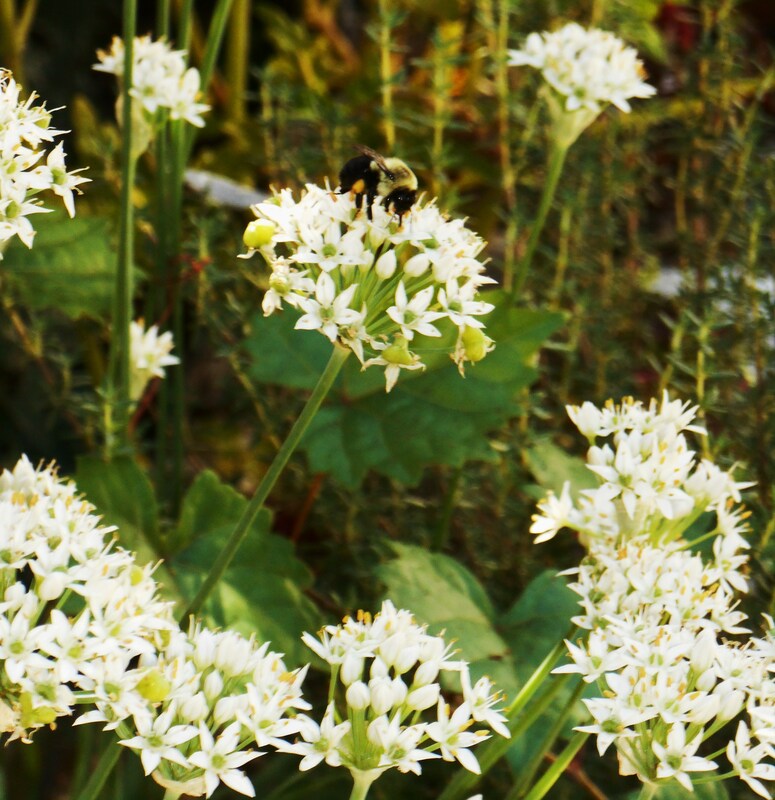 Here is a list of some annuals, perennials, herbs, vines, and shrubs I grow to feed and attract hummingbirds, butterflies, bees, dragonflies, and song birds. 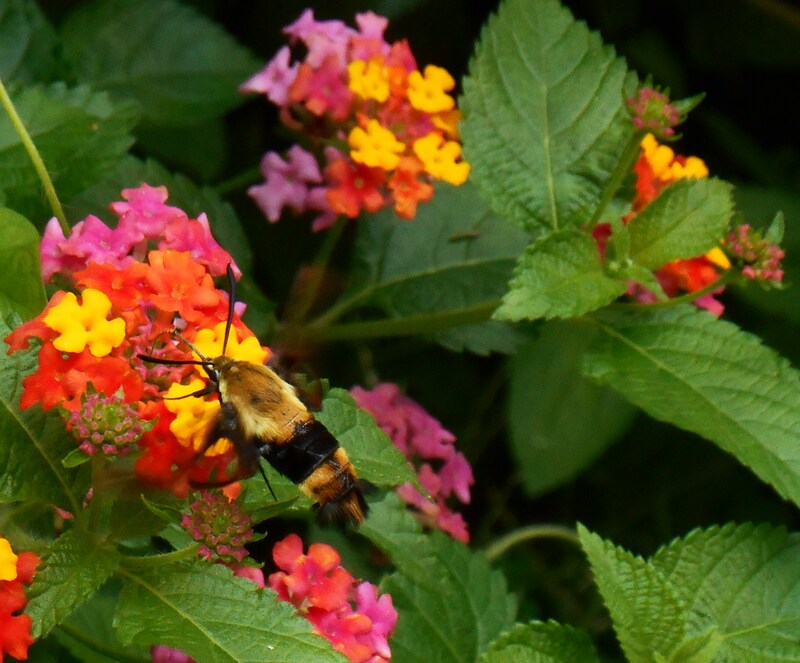 A hummingbird moth feeds from our Lantana. 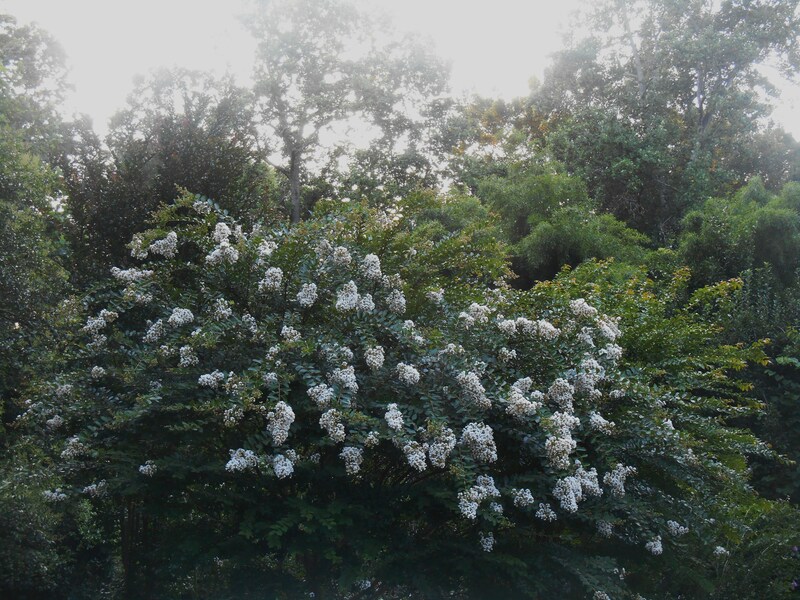 This is one of the many Crepe Myrtle trees growing around our garden. 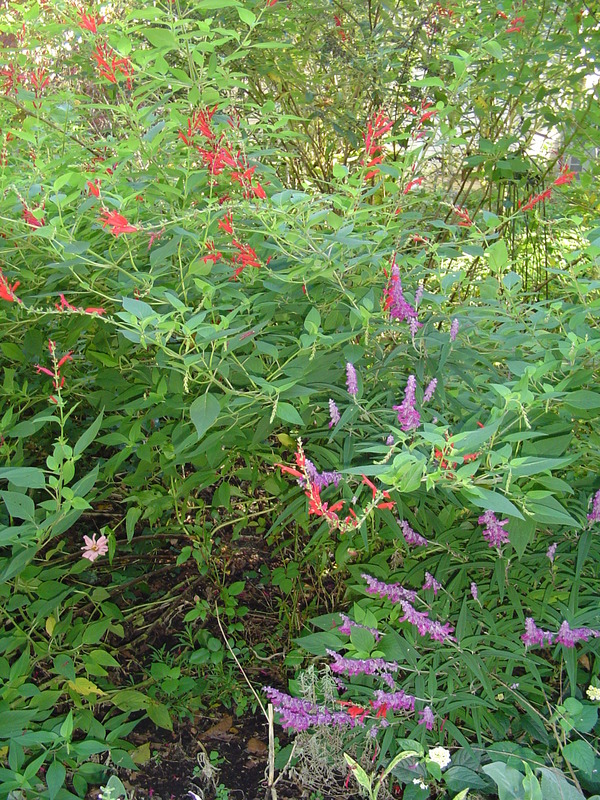 Mexican Blue Sage and Pineapple sage are the main attraction in the butterfly garden at the end of October. An auspicious visit, hummers symbolize the enjoyment of life and lightness of being. Perfect! Was someone wearing red or a floral print?! Sometimes I get ‘checked out,’ too, esp. when I wear my coral flower print tee. My friend had several bright hummingbirds printed on her top 😉 Interesting, isn’t it? That’s great! He was checking out the new neighborhood competition– lol!